The concept of utilizing DNA for large-scale identification purposes was first seriously proposed by Hebert et al. (2003), who considered DNA barcoding (hereafter “barcoding”) to be the only serious option for widespread taxonomic identification and description in the face of collapsing taxonomic expertise and the dramatic rate of biodiversity loss. Since then, barcoding has been a growing area of research (Figure 1) with over 6,000 papers published at the time of writing. In the years that followed Herbert et al. 's seminal paper, vigorous debate in the literature continued regarding the potential role of barcoding and its relationship with taxonomy. Serious concerns were raised that barcoding could be touted as a replacement for traditional taxonomic research, resulting in further erosion of funding and recognition of the intrinsic value of biological reference collections, their curation, and the taxonomic foundational nature of the studies upon which most other biological sciences are built (Ebach and Holdrege, 2005a,b; Gregory, 2005; Hebert and Gregory, 2005; Schindel and Miller, 2005; Will et al., 2005; de Carvalho et al., 2007; Miller, 2007). There has been greater recognition recently of the need for barcoding initiatives to be built on strong and dynamic taxonomic foundations in order to provide reliable identification capabilities (Collins and Cruickshank, 2013; Pečnikar and Buzan, 2014). Museums and herbaria are well placed to lead the development of such high quality barcoding reference libraries, utilizing the curated specimens they house (Puillandre et al., 2012). Indeed, the prevailing modern view amongst herbaria is that twentyfirst century collections institutions should be leading participants and collaborators in “big” data initiatives (Funk, 2018). Figure 1. Publication trends in DNA barcoding and metabarcoding from ISI Web of Science. (A) Number of publications per year for DNA barcoding (gray) and DNA metabarcoding (black). 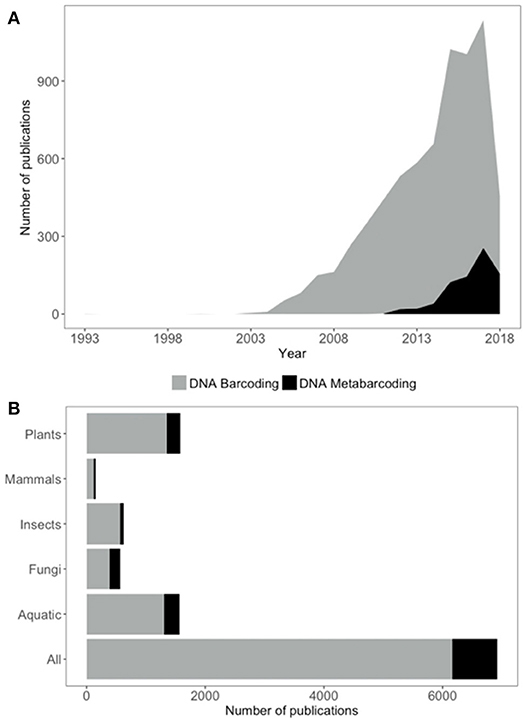 (B) Number of DNA barcoding (gray) and metabarcoding (black) publications for different groups of organisms. Database searches undertaken 6th June 2018. See Supplementary Data for exact search terms used. DNA metabarcoding (hereafter “metabarcoding”) is a special case of barcoding applied to samples that contain more than one organism. Metabarcoding utilizes the same reference databases as barcoding, but allows identification of taxa from mixed samples by using high throughput sequencing methods (Taberlet et al., 2012; Cristescu, 2014). Metabarcoding is an emerging area of research with over 600 papers at the time of writing (Figure 1). The potential of metabarcoding applications is expansive, with the prospect of rapidly determining the species composition of virtually any sample. From environmental monitoring (Kimmerling et al., 2018; Yan et al., 2018) to diet analysis (Xiong et al., 2017; Buglione et al., 2018; Robeson et al., 2018), enhanced biosecurity capabilities (Borrell et al., 2017) and detection of illegal trade (Arulandhu et al., 2017; de Boer et al., 2017), metabarcoding could provide cost-effective and reliable identification for a wide range of regulatory, conservation and commercial purposes. However, the practical applications of both barcoding and metabarcoding are often hampered by the absence of quality reference databases on which to base identifications. Of all the taxonomic groups to which barcoding and metabarcoding methods are applied, identification of plants is the most common (Figure 1). Identification of aquatic organisms is also well represented in the literature, although the taxonomic breath of this group is obviously large and potentially overlapping with other groups. Identification of insects, fungi, and mammals are all less well represented with fewer than half the number of papers compared to those that address plants or aquatic organisms (Figure 1). Despite this appetite for genetic plant identification, systematic development of barcoding reference databases that comprise whole (or majority) flora of particular regions are sparse (but see de Vere et al., 2012; Saarela et al., 2013; Kuzmina et al., 2017). Instead, most studies develop partial reference databases and/or utilize genetic repositories such as GenBank to augment their resources which then requires post hoc data quality control (Leontidou et al., 2018; e.g., Kumar et al., 2018). The responsibility for accurate initial specimen identification and sequence data quality lies solely with the data generator for standard submissions to GenBank and there is often very little information upon which veracity can be assessed (e.g., voucher specimen meta-data, raw sequencing data files). Reliance on data that has not been derived from well curated and vouchered specimens poses risks of misidentification, an issue that is well recognized for GenBank data (Crocetta et al., 2015; Smith et al., 2016; Balakirev et al., 2017). A recent study of fish barcode sequences found evidence for potential errors in ~4% of sequences (Li et al., 2018). Other data repositories, such as the Barcode of Life Data system (BOLD) (Ratnasingham and Hebert, 2007), address this issue through the requirement for more complete meta-data and appropriately vouchered specimens before sequence data can be accepted. However, due to these stricter requirements, the number of species included in BOLD is far fewer than that represented in other repositories with less rigorous requirements. Recent estimates suggest that BOLD currently contains some barcoding information for ~20% of described land plants and, at the current rate of addition, it will take >64 years for the database to be complete (Wilkinson et al., 2017) without consideration of undescribed species. The flora of Australia contains over 23,000 formally recognized species and is characterized by several biodiversity hotspots and high species and genus level endemism (Crisp et al., 1999; Costion et al., 2015; Keith and Tozer, 2017). It is well sampled and expertly curated across the nation's herbaria, coordinated through the Council of Heads of Australasian Herbaria (CHAH). To date, most DNA barcoding publications in Australia deal with a specific taxon of interest, e.g., Acacia (Nevill et al., 2013), Poaceae (Birch et al., 2017), with very few systematically approaching the task for specific regions in conjunction with herbaria (but see Costion et al., 2011; Shapcott et al., 2015, 2017; Howard et al., 2016). We posit that there now exists a tremendous opportunity to augment existing barcoding initiatives in Australia and undertake coordinated and systematic sequencing of the entire flora, harnessing the vast collections of herbarium specimens (including vouchered tissues in silica ready for DNA extraction) to provide a comprehensive and taxonomically robust reference database for plant barcoding and metabarcoding applications. In the remainder of this paper, we consider the technical advances that now make large-scale herbarium sampling the most cost-effective approach for database development and identify priorities for additional specimen and sequence collection to improve the taxonomic coverage and local completeness of reference databases. We also highlight future applications of a comprehensive barcoding and metabarcoding system for Australian plants. The issue of appropriate barcoding loci is a particular challenge for plants, where the mitochondrial cytochrome c oxidase 1 (CO1) locus used almost ubiquitously in animals with great success (but see Deagle et al., 2014), fails to provide useful resolution due to the generally slow rate of mitochondrial evolution in plants (Chase et al., 2007; Erickson et al., 2008). The challenge is threefold: (1) Selection of (an) appropriately variable marker(s) to allow a standardized barcoding approach that provide(s) sufficient resolution to distinguish species; (2) Selection of an appropriately short and variable marker to allow a standardized metabarcoding approach; and (3) Development of protocols for barcoding reference database building that are robust to advances in 1 and 2 above. Here we consider each of these challenges in turn. A selection of standard barcoding loci for plants was made in 2009 by the Consortium for the Barcode of Life (CBOL) Plant Working Group which recommended that rbcL and matK be the loci of choice, plus other plastid or DNA markers as required. The decision was made with recognition that these two loci can only distinguish ~70% of species and represent a trade off in terms of universality, sequence quality, discriminatory power and cost of application (CBOL Plant Working Group, 2009). While rbcL and matK remain the standard, a number of other loci are now also routinely used in plant barcoding studies in order to improve resolution in the specific taxon of interest (Kress and Erickson, 2007; Fazekas et al., 2008; Vijayan and Tsou, 2010; Hollingsworth et al., 2011; Li et al., 2015), ITS is recommended as a third core locus for seed plants (China Plant Bol Group et al., 2011) and psbA-trnH is the most commonly used additional locus (Kress and Erickson, 2012). A number of cpDNA loci have been found to be variable within species in Australia (Byrne and Hankinson, 2012) and elsewhere (Dong et al., 2012; Shaw et al., 2014). These loci have also proved valuable in assessment of relationships at lower taxonomic levels and have been used to distinguish closely related species and intraspecific taxa (Shepherd et al., 2013; Anderson et al., 2016). Ultimately, as sequencing technology continues to advance, larger and more numerous genomic regions can be applied to barcoding to improve specimen identification capabilities for specific purposes (e.g., Tonti-Filippini et al., 2017). In particular, developments that facilitate the discovery and application of more informative nuclear loci will have a greater role to play, due to the limits of species resolution within the plastid genomes that currently dominate barcoding and metabarcoding loci thanks mainly to their relative abundance in specimen tissues (Hollingsworth et al., 2016). Metabarcoding relies on determining unique taxa from mixed samples and so presents some specific requirements in terms of locus selection. To be truly universal, metabarcoding would require the inclusion of multiple loci, each optimized to capture species-level resolution in different taxa (e.g., CO1 for fauna, matK/rbcL for plants, ITS for fungi). However, whereas multiple loci sequence data can be combined for analysis of individual specimens in barcoding to improve taxonomic resolution (e.g., Li et al., 2017), the single bulk sample used in metabarcoding prohibits such treatment. Instead where multiple loci are utilized in metabarcoding, their results must be analyzed independently then combined to produce a list of likely taxa in the sample (Arulandhu et al., 2017). Further, variation in primer binding sites around metabarcoding loci often require the inclusion of multiple primer sets that are optimized to amplify various taxa, and mismatching of primer binding sites within a sample can lead to species detection failure (e.g., Miya et al., 2015). Locus selection must also be mindful of the quality of DNA likely to be recovered from a sample. In samples where target organisms are likely to be alive, such as the microorganisms in soil, good quality DNA can be anticipated and hence longer loci employed. However, where remnants of organisms are the likely DNA source (such as trace plant or animal material in the environment), DNA is likely to be degraded and hence present challenges to the successful amplification of long loci. There are additional restrictions from the sequencing platform maximum read length, which is typically shorter than some of the longer barcoding loci (e.g., matK) meaning only partial sequences can be obtained. Therefore, short but highly informative loci are optimal for metabarcoding applications, with due consideration given to universality of priming sites within the target taxa (Coissac et al., 2012). Similarly to barcoding, the options for genomic regions to be applied to metabarcoding will expand as sequencing capabilities expand (Porter and Hajibabaei, 2018). There have been a number of modifications of the standard barcoding loci which target shorter, taxonomically informative parts of the sequence in metabarcoding studies especially when using degraded DNA (e.g., García-Robledo et al., 2013; de Vere et al., 2017; Erickson et al., 2017). Metabarcoding of mixed samples has the potential for additional information to be derived from analyses, namely the quantification of DNA contributors as a proxy for abundance. However, while there can be a correlation between the proportions of sequencing reads and species in a mixture (Kraaijeveld et al., 2015; Evans et al., 2016) this is generally weak and not a reliable indicator of mixture proportions (Smart et al., 2017). There are multiple biases that can impact quantification accuracy; some specific to the loci being used (e.g., copy number in the genome, Angly et al., 2014; primer mismatches, Elbrecht and Leese, 2015; Piñol et al., 2015; Deiner et al., 2017) and some independent of loci choice (e.g., DNA isolation methods, Brooks et al., 2015; polymerase sequence affinity, Nichols et al., 2018; sampling approaches, Deiner et al., 2017). Various methods have been proposed to control for these biases to better facilitate accurate quantification of relative abundance from metabarcoding data, including the utilization of degenerate primers (Krehenwinkel et al., 2017a,b), incorporation of gene copy number information (Kembel et al., 2012) and the inclusion of control species to generate relative correction factors (Thomas et al., 2016). We anticipate that methods for more accurate abundance quantification through metabarcoding will be available in the coming years through further expansion of metabarcoding loci, improved understanding of biases, and the use of PCR-free sequencing approaches (Liu et al., 2016). Given the variety of loci that have been targeted in barcoding and metabarcoding studies, along with the future capacity for further expansion in the breadth of genomic regions used, there is pressure for database-building approaches to maximize their future utility. Most of the effort in reliable database formation is in the collection and curation of taxonomically robust reference specimens, and their sampling for DNA analysis. Sequencing costs, although by no means trivial, are a minor component by comparison. Hence, there is great value in ensuring that the process of collection and sampling does not have to be repeated each time a new locus is optimized for barcoding or metabarcoding purposes. Both silica-dried DNA vouchers (Gaudeul and Rouhan, 2013) and extracted DNA banks (Hodkinson et al., 2007) are expected to become increasingly valued for this reason, thus having central locations for curation and storage of these resources is likely to facilitate more efficient database-building. There are well documented protocols available for how to create and curate DNA barcode reference libraries (Kress and Erickson, 2012). Future databases will ideally seek to employ sequencing methods that provide the most information (whilst maintaining cost efficiency and practicality), such as various whole-genome sequencing and target-enrichment approaches (Hollingsworth et al., 2016; Tonti-Filippini et al., 2017; Porter and Hajibabaei, 2018). We suggest that large-scale plant-barcoding reference-database building is highly relevant to the core business of all herbaria, due to their unique positioning as repositories of the world's flora. A recent review by a leading collections institution botanist states; “Collections are a gold mine of both information and tissue samples and more advances are on the way” (Funk, 2018). Effective plant barcoding and metabarcoding applications require the following with respect to reference databases: (1) Inclusion of multiple individuals from a broad suite of taxa to encompass a high proportion (if not all) of the possible species and to capture intraspecific diversity; (2) Accurate taxonomic identification of the included reference specimens; (3) Curation of reference specimens to retain as a resource for further study; (4) Availability of suitable material for destructive sampling for DNA extraction; (5) Extraction of DNA for sequencing and archiving; (6) Sequencing of a broad range of genomic regions according to standard protocols; (7) Data analysis according to standard protocols and meta-data sharing nomenclature; (8) Data archiving according to standard protocols; (9) Data fit for purpose, including ongoing data curation, and easily available for broad utility. We consider that points 1–4, which deal with the collection and curation of voucher material, are already fulfilled by herbaria. Point 5 considers the extraction and storage of DNA, which is also currently undertaken by many herbaria or in conjunction with research partners. Points 6–9, are concerned with data generation, analysis, storage and availability, which we contend should be further developed through consensus as part of large-scale and coordinated analyses of herbarium collections in conjunction with participating research organizations such as universities. Herbaria exist primarily to collect and help preserve the world's flora and interpret taxonomic relationships (point 1), but herbarium data also has a wide breadth of other important applications (Heberling and Isaac, 2017; James et al., 2018). It can be argued that no identification can be guaranteed to be 100% accurate (point 2) but that is the purpose of ongoing curation (point 3), to facilitate corrections and updates to taxonomic designations of specimens (Funk et al., 2005) and provide the means to avoid or correct the “error cascades” that can result from misidentification of reference materials (Bortolus, 2008). One of the major reasons that herbaria have not historically been the automatic go-to place for barcoding reference specimens is the availability of material suitable for DNA extraction. The issue is twofold; firstly, herbaria are understandably reluctant to allow extensive destructive sampling of their often irreplaceable and finite resources (although it is usually permitted under controlled conditions, except in some special circumstances such as with type specimens or where destructive sampling would damage the future utility of the specimen); secondly, the methods of collection and preservation (plus the length of time since collection) of herbarium specimens generally leaves the DNA that can be extracted in various stages of degradation. Degraded DNA is usually difficult to barcode due to short fragment lengths, an issue of greatest concern with the longer DNA barcodes. Several advances have now been made to largely overcome the above concerns. Firstly, it is now common practice for herbaria to include material suitable for DNA extraction in their field collection protocols; leaf or other suitable tissue can now be routinely used for DNA extraction without compromising the integrity of voucher specimens (Gaudeul and Rouhan, 2013; Funk et al., 2017). These tissues are also stored in a way that preserves the tissue for high quality DNA extraction, usually rapidly desiccated and stored on silica gel (point 4). In other special cases, extraction methods have been developed that avoid destructive sampling (Shepherd, 2017). Further, advances in sequencing approaches have reduced the requirements for long unfragmented sections of high molecular weight DNA (Hart et al., 2016; Hollingsworth et al., 2016) making herbarium material progressively more suitable for DNA extraction. However, some preservation methods used for herbarium specimens (particularly in the tropics where humidity often prevents efficient and continual desiccation) have a negative impact on plant DNA quality, such as the use of ethanol and formalin (Staats et al., 2011). These issues make historic collections preserved in this way more unsuitable for DNA extractions. Despite improvements in extraction and sequencing of DNA from herbarium specimens, there remain issues with potential sequence modification and sequencing errors that need to be understood and accounted for in downstream analyses (Staats et al., 2011; Weiß et al., 2016). Archiving of silica-dried leaf material for DNA extraction, as well as extracted DNA samples, are also increasingly routine procedures in herbaria and associated research organizations where appropriate long-term storage facilities are available (Seberg et al., 2016) (points 4 and 5). There is no global consensus on the best technical methods for generating and analyzing plant sequence data for building large-scale barcoding reference databases. Advances in technology will continue to reduce sequencing costs and increase the sequence coverage, hence adopting a single rigid sequencing approach is probably unwise. There is an opportunity for consortia of herbaria and other research institutions to develop and implement local standard protocols for sequencing and data analysis in the pursuit of complete regional flora databases (e.g., Kress and Erickson, 2012; Kuzmina et al., 2017) (points 6 and 7). Appropriate archiving and publication to allow broad re-use of the data are important for effective plant DNA barcode databases (Wilkinson et al., 2016) (points 8 and 9). Currently, archiving of molecular data is routinely undertaken by partners of the International Nucleotide Sequence Database Collaboration (INSDC) (Karsch-Mizrachi et al., 2018), which have a variety of database products suitable for different data types. BOLD also accepts barcoding reference data and integrates with GenBank, with a particular identifier included to indicate that the sequence data meets the stricter barcode criteria with respect to reference specimen taxonomy and curation. With barcode data retrieved from existing herbarium collections, there is also the opportunity to link to the great wealth of information already collected and made available on specimens through national data portals such as the Australasian Virtual Herbarium (AVH; avh.chah.org.au), the Atlas of Living Australia (ALA; ala.org.au), and Canadensys (canadensys.net). Other international networks include the Global Genome Biodiversity Network (GGBN; ggbn.org) and the Global Biodiversity Information Facility (GBIF; gbif.org). The challenge lies in developing synergies between these offerings to ensure that data links remain dynamic and updates to taxonomy propagate throughout the system. DNA sequence data also requires curation, not just the specimens themselves. The release of the GGBN Data Standard specification (Droege et al., 2016) goes some way to supporting that end. In 2017, the GGBN conducted a public consultation on their proposed set of augmented terms dedicated to high throughput sequence library preparation, the results of which are yet to be released at the time of writing. International data standards for biodiversity information are developed and maintained by Biodiversity Information Standards, also known as the Taxonomic Databases Working Group, (TDWG; tdwg.org) which provides a technical framework for developing appropriate data sharing nomenclature. We anticipate that there will be further developments in public access portals over the coming years that will offer more fit-for-purpose solutions for archiving and accessing complex genomic data derived from reference specimens, the practical requirements of which will be best understood through collaborative efforts to undertake large-scale reference database generation. The practical applications of an accurate and affordable barcoding and metabarcoding system in Australia are substantial. Its development would provide many benefits through a concerted effort of national science infrastructure building. Here, we review the DNA reference data currently available through GenBank for Australian plant taxa and present a range of potential applications of a comprehensive floral DNA reference database, with both economic and environmental benefits to Australia. This provides a basis for the development of a comprehensive barcoding reference database for Australian plants. We used the Australian Plant Census (anbg.gov.au/chah/apc; accessed 21/3/2018 and 24/07/2018) to generate a list of accepted plant species names for Australian Embryophyta. We used the Matrix Maker script (Freyman and Thornhill, 2016) to search GenBank (searches conducted April and July 2018) against the resultant list of Australian plant names for seven commonly used barcoding loci (matK, rbcL, ITS, ndhF, trnL-trnF, atpB-rbcL, and psbA-trnH). We found that 10,779 of 23,057 (47%) of Australian species listed in the Australian Plant Census (current taxa) had no DNA barcoding data available for any of the seven loci evaluated, and 44% have no data on GenBank of any kind. Only 14% of species had data for all three of the core loci (matK, rbcL, ITS). At the family level, 11 of 360 families (3%) had no data at all for any of the seven loci, with 130 families (36%) containing no data on the three core loci. For the largest 43 families, which each contain >100 species and together represent 78% of the flora of Australia, 50% of species had no data for the seven loci and only 12% of species had data for all three core loci. Results can be found in Supplementary Material. From our GenBank survey data we make recommendations for prioritizing taxa for future barcoding database-building initiatives in Australia to improve identification capacity (Table 1). Table 1. Recommendations for priority taxa for barcode database building in Australia, based on a survey of data available in GenBank against the Australian Plant Census. Biodiversity monitoring provides critical baseline data that enables change detection, and elucidation of temporal patterns in ecosystem dynamics (Lindenmayer and Gibbons, 2012; Schmeller et al., 2017). Australia has recognized the need for collection and curation of this science infrastructure, realized by the ongoing support of the Terrestrial Ecosystem Research Network (TERN; tern.org.au), which collects a wide variety of data and physical samples to enable characterization of Australian ecosystems and collaborates closely with CHAH to ensure taxonomic integrity of their data. Accurate and comprehensive monitoring programs are extremely resource intensive, as such there is an opportunity to augment these initiatives with more rapid methods for biodiversity assessment (Thomsen and Willerslev, 2015; Bonin et al., 2018), and indeed to validate the utility of these newer methods using comprehensive data collected from traditional monitoring approaches (Aylagas et al., 2016). In Australia, the availability of a comprehensive DNA barcoding reference database for plants would pave the way for more accurate and cost-efficient plant biodiversity monitoring tools to augment existing programs (Thompson and Newmaster, 2014). Identification of plant species is also a fundamental component of conservation and management planning (Margules and Pressey, 2000) and of assessing potential impacts of development and changing land use (Glasson and Therivel, 2013). These activities have traditionally used standard morphological taxonomic approaches, although these can be problematic where taxonomic expertise is limited, for species that are difficult to distinguish using morphological characters, or where surveys need to be conducted at particular times of the year (e.g., when species are flowering and/or fruiting) (Hollingsworth et al., 2016). Barcoding of floras can establish a reference database that provides a basis for molecular identification of plant species at any time of the year and for small tissue samples. A project is underway to commence a reference database of species in the Pilbara region of Western Australia, an important area of economic development and assessment of flora for environmental impact assessment. Molecular identification of plants using barcoding has the potential to provide a timely and cost-effective approach for application in conservation planning and environmental impact assessment. A variety of animals, predominantly insects, but also some birds, reptiles and mammals, provide pollination services for the majority of wild and cultivated plants (Potts et al., 2016; Hung et al., 2018). In Australia, some 65% of crops rely on the European honeybee (Apis melifera) for pollination (Keogh et al., 2010) and many likely also benefit from pollination from native pollinators (Garibaldi et al., 2013). Understanding pollination networks is key for optimizing the pollination services provided in both agricultural and natural settings and for examining the return of functionality to restored sites; by determining what floral resources are being utilized by pollinators, it is possible to develop strategies to maximize a desired outcome. For example, retaining or planting vegetation that can sustain pollinators between cropping seasons in order to maximize pollination services during crop flowering season (Asbjornsen et al., 2014). Revealing pollination networks has traditionally relied on labor intensive observation studies, which record pollinator visitations to particular plant species. As pollination involves the physical movement of pollen from one plant to another via a pollinator, floral resource use can also be investigated by analyzing pollen collected by pollinators. This approach has been shown to better characterize pollination networks, revealing more interactions than visitation data alone (Bosch et al., 2009). Morphological identification of pollen through microscopy can be undertaken but requires significant time and skill, and taxonomic resolution is also generally limited to the genus or (more commonly) family level. Metabarcoding of collected pollen offers the opportunity to quickly determine the floral resources visited by pollinators and reveal pollination network associations (Bell et al., 2017). 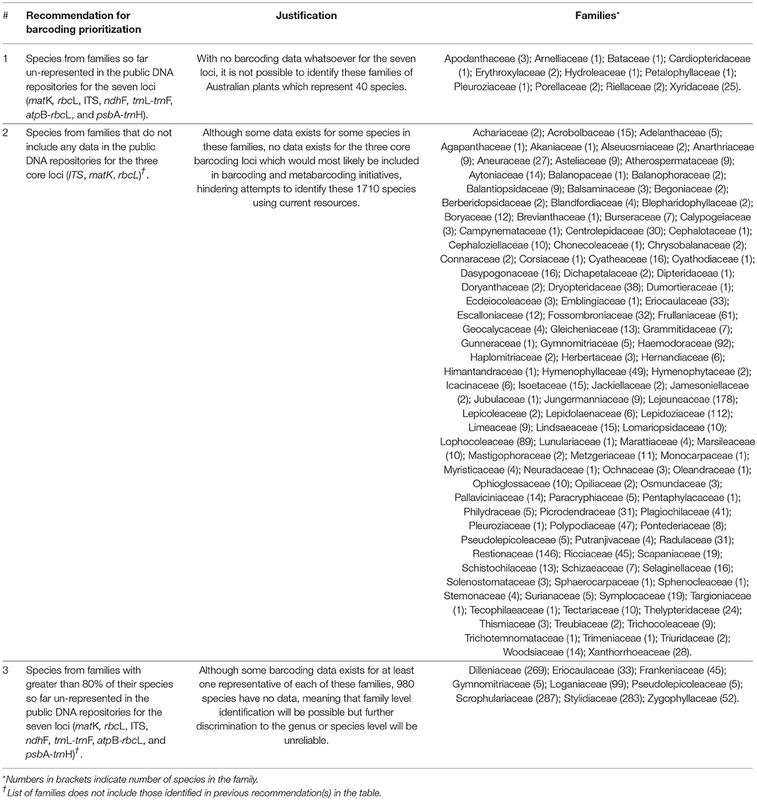 Metabarcoding has been shown to be capable of identifying more taxa than pollen morphological identification, particularly for infrequently detected species (Keller et al., 2015; Richardson et al., 2015b; Smart et al., 2017) as well as more connected plant-pollinator interaction networks (Pornon et al., 2017). Identification to the species level relies on sufficiently complete barcode reference databases for plants (Cornman et al., 2015; Galliot et al., 2017; Pornon et al., 2017). Opportunities for quantifying pollen carriage using metabarcoding have also been investigated, with strong indications that the number of sequencing reads are correlated with taxon abundance (Keller et al., 2015; Richardson et al., 2015a; Pornon et al., 2016). These data are of great interest in pollination network research as they reveal the relative contributions of various pollen resources to pollinator diets and help quantify the importance of particular pollinators to plant species. However, further work is required to understand the limitations of the approach for accurate quantitative analysis of pollen loads (Bell et al., 2017). Accurate and comprehensive data on pollinator resource utilization in Australia would help in the design and implementation of strategies to secure pollination services for crops, and further incorporate the protection and promotion of pollination services in ecological restoration and conservation practices. Understanding the biological components of traded materials is critical in order to uphold regulations regarding the legality, safety and legitimacy of products. The potential applications of barcoding and metabarcoding here are many, yet there has been very little utilization of them to date within Australia. This is in part due to the lack of comprehensive and reliable reference data. Plant barcoding and metabarcoding can be used to verify the identification of traded ornamental and agricultural plants, including timber (Dormontt et al., 2015; Ng et al., 2016; Staats et al., 2016), to detect the importation or movement of invasive species (Scriver et al., 2015; Xu et al., 2018), and determine the contents of botanical products such as traditional medicines (Newmaster et al., 2013; Seethapathy et al., 2015; Xin et al., 2015). Barcoding represents a potential additional tool for border security purposes as well as for businesses who could also utilize barcoding and metabarcoding services to internally verify compliance and demonstrate due diligence (Lowe et al., 2016). In addition to the applications described above, this section briefly describes some additional applications that have been demonstrated in the international literature which could prove useful in the Australian context. Barcoding and metabarcoding of pollen and plant fragments have been utilized to assist in forensic applications where determining geographic origin is important (Ferri et al., 2009; Bell et al., 2016). Metabarcoding can be applied to the analysis of gut contents, enabling dietary analysis of animals. This application can assist in determining the threat posed to species from herbivory from certain animals (e.g., Nakahara et al., 2015; Nichols et al., 2016), as well as enabling the dietary requirements and food webs of threatened animal species and communities to be determined in order to facilitate both ex situ and in situ conservation efforts (De Barba et al., 2014; Srivathsan et al., 2015). The application of metabarcoding methods to ancient sedimentary DNA can also help elucidate historical ecosystem dynamics (Thomsen and Willerslev, 2015; Parducci et al., 2017) and has been shown to perform better than pollen analysis (Alsos et al., 2016; Niemeyer et al., 2017) for species richness estimation. Finally, metabarcoding of air samples has been demonstrated as effective in assessing pollen loads and therefore allergen risks, and has potential human health implications (Kraaijeveld et al., 2015). All of these broad applications of barcoding and metabarcoding would be facilitated by the availability of comprehensive barcode reference databases, particularly of plants. DNA barcoding has developed at an accelerating pace over the last 15 years, with rapid improvements in information content thanks to high throughput sequencing approaches, determination of standard (core) loci, the building of reference databases, and the determination of community standards. However, plant barcoding in Australia is currently ad hoc, with no publicly available reference data for almost half of all Australian plant species. We recommend that a consortium of herbaria and other research institutions is formed with the explicit aim of developing a comprehensive DNA barcode reference database for the entire flora of Australia, starting with the plant families identified in Table 1. We further recommend the consortium pursue integrated funding opportunities that leverage existing resources, given the success of this consortium approach by Australian herbaria in other initiatives such as the AVH and ALA. Exemplar specimens from each species could be selected from existing collections or sourced through targeting sampling campaigns to capture both inter and intra specific species variation and geographic breadth. DNA extractions and sequencing could be undertaken in specialist partner laboratories in high volumes to maximize efficiencies and minimize methodological variation. Data analysis and curation could be centrally managed to ensure comprehensive and consistent data availability. The applications for a robust and comprehensive plant barcoding system in Australia are diverse, and represent a range of potential benefits both economically and ecologically. From improved pollination services for agriculture, to more efficient monitoring of ecosystems, greater protection of threatened species, increased capacity for detection of invasive species and assurance of biological product authenticity, barcoding and metabarcoding can provide access to unprecedented amounts of biological information regarding the Australian environment and how we utilize and interact with it. In order to realize these benefits, we argue that large scale and coordinated analysis of herbarium collections are required to ensure the most cost-effective and taxonomically robust system be available to the community in perpetuity. The generation and curation of DNA reference data should become a national investment priority and recognized as essential science infrastructure. The dataset for this study can be found in the Supplementary Material. All authors were involved in manuscript inception. ED drafted the manuscript. ED, EB, and MW carried out data analysis. FE-V prepared the figure. All authors helped revise the manuscript and gave final approval for publication. This work was supported by funding from the Australian Government Department of Agriculture and Water Resources as part of its Rural R&D for Profit program. PN was supported partly by the Australian Government through the Australian Research Council Industrial Transformation Training Centre for Mine Site Restoration (project number ICI150100041). FE-V was supported by CSIRO FSP Environomics. The genesis of this paper came from discussions at the National Pollination DNA Barcoding Workshop held at the University of Adelaide in November 2017. The authors thank Ainsley Calladine of the State Herbarium of South Australia for assistance in comparison of GenBank data with the Australian Plant Census current taxonomy, and three reviewers whose constructive comments improved the manuscript. Finally, the authors would like to acknowledge the many and varied herbarium staff whose tireless work contributes to most botanical papers without sufficient recognition. Supplementary Material. Excel file containing data for the paper. GenBank APC (first tab) is a table of the number of species within families of Australian plants (obtained from the Australian Plant Census) that have data on GenBank for seven barcoding loci (ITS, matK, rbcL, trnL-trnF, ndhF, atpB-rbcL, psbA-trnH). Data field descriptions (second tab) describes the field names used in GenBank APC in more detail. WoS Barcoding (third tab), WoS Metabarcoding (fourth tab) and WoS Groups (fifth tab) provide the data retrieved from Web of Science used to generate Figure 1 in the paper. Bonin, A., Taberlet, P., Zinger, L., and Coissac, E. (2018). Environmental DNA: For Biodiversity Research and Monitoring. Oxford, UK: Oxford University Press. Chase, M. W., Cowan, R. S., Hollingsworth, P. M., Van Den Berg, C., Madriñán, S., Petersen, G, Wilkinson, M., et al. (2007). A proposal for a standardised protocol to barcode all land plants. Taxon 56, 295–299. Crisp, M., West, J., and Linder, H. (1999). “Biogeography of the terrestrial flora (section 3),” in Flora of Australia Volume 1 Introduction, eds. A. Orchard and H. Thompson. (Melbourne, VIC: Australian Biological Resources Study/CSIRO Publishing), 321–367. Erickson, D. L., Spouge, J., Resch, A., Weigt, L. A., and Kress, J. W. (2008). DNA barcoding in land plants: developing standards to quantify and maximize success. Taxon 57, 1304–1316. Glasson, J., and Therivel, R. (2013). Introduction to environmental impact assessment. London: Routledge. Keith, D. A., and Tozer, M. G. (2017). “Girt: A continental synthesis of Australian vegetation,” in Australian Vegetation, 3rd revised edn, ed D. A. Keith (Cambridge, UK: Cambridge University Press), 3–39. Keogh, R., Robinson, A., and Mullins, I. J. (2010). Pollination Aware: The real value of pollination in Australia. Barton: RIRDC. Lindenmayer, D., and Gibbons, P. (2012). Biodiversity Monitoring in Australia. Collingwood: CSIRO Publishing. Vijayan, K., and Tsou, C. H. (2010). DNA barcoding in plants: taxonomy in a new perspective. Curr. Sci. 99, 1530–1541. Copyright © 2018 Dormontt, van Dijk, Bell, Biffin, Breed, Byrne, Caddy-Retalic, Encinas-Viso, Nevill, Shapcott, Young, Waycott and Lowe. This is an open-access article distributed under the terms of the Creative Commons Attribution License (CC BY). The use, distribution or reproduction in other forums is permitted, provided the original author(s) and the copyright owner(s) are credited and that the original publication in this journal is cited, in accordance with accepted academic practice. No use, distribution or reproduction is permitted which does not comply with these terms.